A spectacular gift for any time of year. 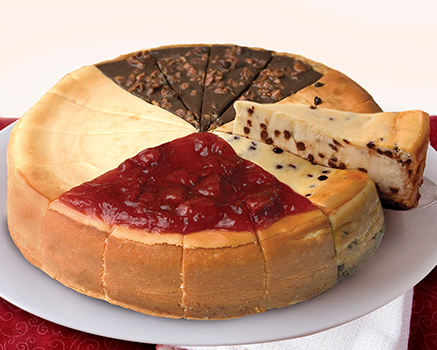 You'll receive one 9" Chocolate Chip Cheesecake, one 8" Turtle Cheesecake and one 7" Original Plain Cheesecake. Arrives stacked in our custom gold and red gift boxes wrapped with a red ribbon, ready for gift giving. 8" and 9" cheesecakes are pre-cut. Tower serves 40. Ingredients: Cream Cheese (Pasteurized Milk and Cream, Cheese Culture, Salt, Carob Bean Gum, Guar Gum), Sugar, Wheat Flour, Egg, Sour Cream (Cultured Nonfat Milk and Cream, Cornstarch, Whey, Guar Gum, Carrageenan, Carob Bean Gum, Enzymes), Heavy Cream (Cream, Carrageenan), Butter (Cream, Salt), Powder Sugar (Sugar, Corn Starch), Modified Corn Starch, Vanilla Extract, Egg Whites, Salt, Soy Lecithin. Ingredients: Cream Cheese (Pasteurized Milk and Cream, Cheese Culture, Salt, Carob Bean Gum, Guar Gum), Sugar, Chocolate Chips (Sugar, Chocolate Liquor, Cocoa Butter, Butterfat, Vanilla, Soy Lecithin and Salt), Sour Cream (Cultured Nonfat Milk and Cream, Cornstarch, Whey, Guar Gum, Carrageenan, Carob Bean Gum, Enzymes), Butter (Cream, Salt), Egg, Caramel Bits [Sugar, Corn Syrup, Liquid Sugar, Skim Milk, Palm Oil, Butter, Salt, Mono- and Diglycerides, Natural Flavor, Soy Lecithin(Emulsifier)], Wheat Flour, Caramel Topping [Corn Syrup, Sweetened Condensed Skim Milk (Condensed Skim Milk, Sugar), Cream, Water, Butter, Maltodextrin, Salt, Carrageenan, Mono- and Diglycerides, Xanthan Gum, Natural Flavor, Sodium Bicarbonate], Pecans, Semisweet Chocolate Chunks (Sugar, Chocolate Liquor, Cocoa Butter, Dextrose, Soy Lecithin, and Vanillin), Heavy Cream (Cream, Carrageenan), Water, Invert Sugar Syrup, Cocoa Powder (Processed with Alkali), Egg Whites, Natural Flavor (Natural Flavoring, Water, Propylene Glycol, Glycerin), Salt, Caramel Color, Stabilizer (Gum Acacia, Propylene Glycol Alginate, Xanthan Gum). ALLERGENS: CONTAINS: Wheat, Milk, Egg, Soy and Tree Nut (Pecan) Allergens. Manufactured on equipment that processes Peanuts and other Tree Nuts.